Not too long ago we were seeing reports of copper wiring being stolen from homes and construction sites and sold for cash. Lately, thieves have been targeting aluminum bleachers to make a quick buck. 21-year-old Austin Zagaros of Brooklyn Center, Minnesota, was arrested for stealing bleachers from a local park. He was caught dragging them down the street to his house. Police say he wanted to sell the aluminum for scrap to buy heroin. Deep in the heart of Texas, Jeanette Nicole DeLaRosa, 18, and Elve Culliver, 42, have been charged in connection with the theft of bleachers from local high schools over the summer. One set of bleachers, valued at $2,400, had been sold to a recycling center for $152. A resident in Royal Oak, Michigan, reported the theft of 172 feet of aluminum bleachers at a local middle school football field. Seven bleacher seats and a foot rail were stolen from a ballpark in New Richmond, Wisconsin, several weeks ago, prompting police to keep a watchful eye on all city parks. 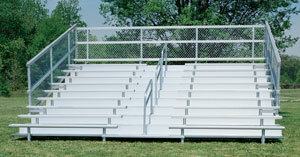 Back in June, two complete sections of bleachers went missing from a school in Apple Valley, California. Police have no leads, but residents have been warned to be alert and report anything suspicious, such as someone driving around with a truckload of bleachers. Now, we can all agree that stealing is wrong. But you at least have to give these bleacher creatures points for originality. "I love to smell like napalm in the morning"